Shakespeare’s history plays defined a genre that is rarely revived in modern theatre. It makes sense, then, that Mike Bartlett would evoke the Bard in this contemporary play about the monarchy, though it’s torn between fact and fiction. King Charles III is a satire on the current Royal Family, with Bartlett posing the question: what will happen when the Queen dies? The plot hinges on the flimsy notion of Charles (now acting as king) refusing to sign a new bill that would restrict freedom of the press (something that is nowadays done out of ceremony rather than true power). Yet once we’ve suspended our disbelief, the play sees him as a tragic figure (in a moving portrayal from Tim Pigott-Smith) torn between duty to his country and to his family – is he a king exercising his right, or has power driven him to madness? Through this, Bartlett explores the ceremonial position of the monarchy in this day and age, questioning whether image is more powerful than constitutional rights, as well as the relationship between the monarchy and the press. 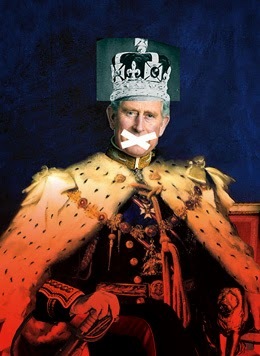 How intrinsic is the monarchy to Great Britain? If you cut away at every British institution, what’s left? And that pearl of wisdom comes, ironically enough, from a lowly kebab shop owner. Rupert Goold’s production brings a great sense of stately grandeur. The set is candlelit, with merely a red-carpeted platform on which the drama plays out – a stunning, minimalist design that remains suitably evocative. Live music, too, adds regal appeal: the play opens with the cast, shrouded in darkness and bearing candles, marching around the stage singing an Agnes Dei like a procession of monks. It only heightens the comedy, which, on the surface, is amusing purely in seeing such recognisable figures satirised on stage. The performers are no mere impressionists, however, though it is perhaps the younger generation that are most successfully portrayed. Oliver Chris’s Prince William balances youth with clear-headed intelligence, whilst Lydia Wilson’s secretly manipulative Kate is hilarious – her monologue explaining her true intentions is amusingly sassy, complete with hair flick. Richard Goulding’s Prince Harry is perhaps the most damning depiction: a young man who longs for a normal life, fascinated by the mundane (“I went to Sainsburys!”) and in love with student Jess (Tafline Steen) who proves herself better than his usual taste for “Sloane fluff”. These characters are far more relatable than their elder counterparts, largely for their current position in the media as the new well-known faces of the monarchy. Much of the comedy, however, stems from Bartlett’s Shakespearean style. This seeps into all levels of the drama, from the themes of monarchy, power and manipulation, to Hamlet-esque ghostly apparitions (the cast as a whole are, of course, haunted by the ghost of Diana), and to the use of blank verse and rhyming couplets. Hearing such contemporary characters speaking lines like “What, ho, here’s comes Kate!” is anachronistically hilarious, though the play is far more than a game of spot the reference. There is tension, however, between the source material and the style. There’s no doubt history was far bloodier in the Tudor period, but Bartlett’s play lacks the drama of Shakespeare. This is a play of subtle, well-paced manipulation rather than gruesome action, yet in attempting to predict realistically what may happen to the Royal Family in the future, the plot conforms to expectations with an ending that feels a little anticlimactic. Bartlett could've been braver and pushed the boundaries more. This is no dramatic flight of fancy – instead it offers both intelligent comment on the current state of Britain and a tightly-woven family drama. It operates on many levels, ensuring there’s enjoyment here for all. Watch: King Charles III runs at the Wyndham's Theatre until 31st January 2015.